Former Special Olympics Nebraska athlete David Steffen aims to fulfill a lifelong dream and continue his quest to build awareness by stepping into the ring March 2nd at Omaha’s Ring Wars. Born with mild Cerebral Palsy, the 28 year old former Special Olympian and current Paralympic Athlete is somewhat of an icon in the state of Nebraska among his fellow athletes. David has amassed 48 gold, 8 silver and 4 bronze medals as well as competing in 6 national championships garnering 2 titles in golf. The highlight came in 2007 winning a golfing silver medal at the world games in China. In 2012 David was inducted into the Nebraska Special Olympics Hall of Fame. Growing up, David was teased by his peers and constantly heard what he could and could not do. Sports were an outlet, emotionally and physically. They provided a way for David to prove not just to kids with no disabilities, but more importantly to himself he could do anything he put his mind to. Over the years David adopted the personal mantra Simply Believe, an affirmation that an iron will and determination can overcome any limitation or adversity life throws at you. David is an avid practitioner of martial arts and combatives sports. Soon he will take another step toward conquering yet another goal. David is slated to compete in a Muay Thai kickboxing bout. David has used this competitive success to raise awareness of special needs athletes everywhere. He recently created his own non-profit program Let Me Fitness that tailors strength and conditioning training to special needs athletes. You can see David compete March 2nd at the TipTop Ballroom as part of Omaha’s Ring Wars. Proceeds of the event support the Nebraska Special Olympics. 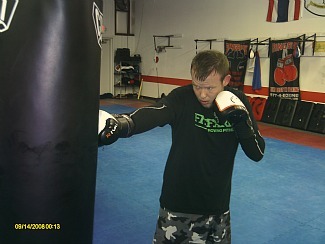 David would like to thank Mid-America Martial Arts, Grudge Training Center, Rival Boxing and Fit Farm.